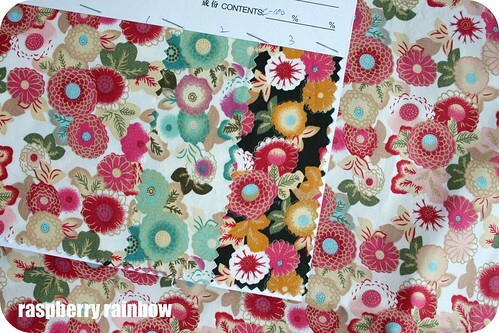 Way back in November of last year, I bought some gorgeous fabric from Craftumi seller Sew Classic. 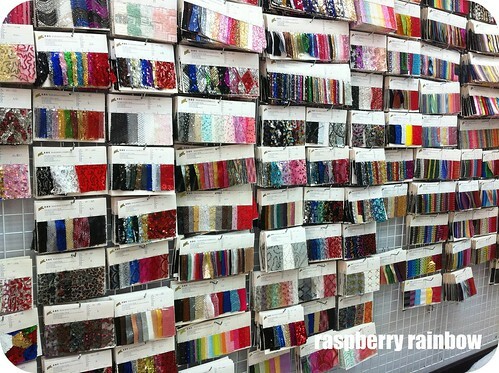 Kennis who runs this shop was really helpful and told me about this blog post listing where to buy fabric in Hong Kong. 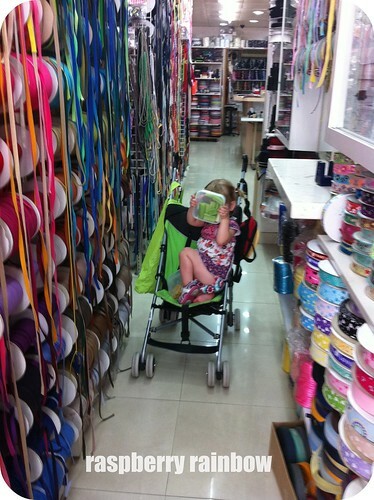 Last week, Zoe and I set off to explore the Sham Shui Po area, where many of the fabric shops are. OH MY GIDDY AUNT. I could never have been prepared for what we found. It was amazing and unbelievable. A fabric lovers heaven. A crafters heaven. Shops and shops of fabric samples. Button shops. Ribbon shops. Lace shops. Bead shops. So much, all in one area. A few shops are wholesale but the rest will sell fabric to the public with a minimum order (3 or 5 yards I found) There is really so much fabric to choose from, all different types, some thing for everyone. Most fabric is not stored at these shops, you have to pay for it and order it in which can take 1-5 days. 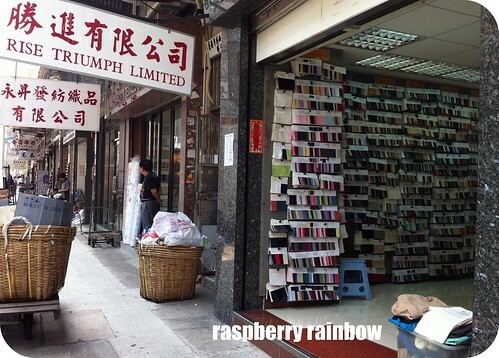 So todays trip to Sham Shui Po was to pick up last weeks fabric orders. I was very restrained (last week) and only got 3 different fabrics, one was a blue solid I needed to help finish off some bunting I am making. I also got these two gorgeous pink florals. I want to make a skirt for me out of the first one and Abbey just informed me she likes it too. How sweet are all the different colourways? Today we found a huge shop of ribbons. Ribbons only. So many. Drool. It was difficult to choose any, I will have to go back when I have a project in mind to use them with. This is Zoe in the ribbon shop, hiding behind a plastic container of celery. As you do. Look all all those ribbons. 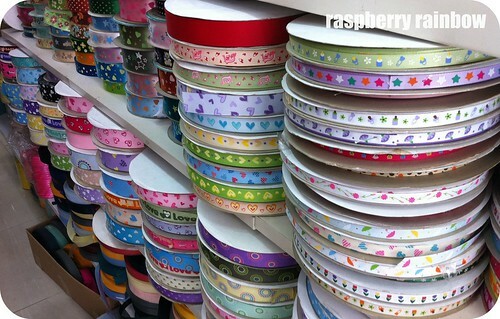 There was one more aisle of ribbons, this photo only shows half of what this shop has. Next week Zoe and I will go back and pick up todays selections. I can not wait! That does look like a fabulous shop - just a shame they make you wait. But wait. Is it a shame, or does it make you more excited! Hopping off to see that chocolate slice recipe! YUM! Sounds like you're loving being a tourist in your new city..
Wow Cat, it looks like a crafting mecca! How fabulous that you have so much variety and so many fabrics right at your fingertips. 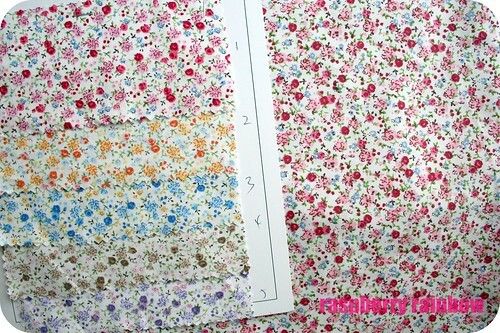 I can't wait to see the creations you come up with using some of these gorgeous prints and colours. That's the only way to be photographed , love it . Wow HK surely is a shoppers paradise. Hello! I just found you via your comment on Shamozal's excellent blog post on expat wives! I see you are in Hong Kong? I was there for 2.5 years (in Seoul now) and it is one of my absolute favourite places in the world! And Sham Shui Po is so amazing right! I especially loved all the ribbon shops. I just saw that you are a Melbourne-ite! That's my home town too!